Joey Bosa (born July 11, 1995) is an American football defensive end for the San Diego Chargers of the National Football League (NFL). He played college football at Ohio State, and was selected by the Chargers third overall in the 2016 NFL Draft. Bosa attended St. Thomas Aquinas High School in Fort Lauderdale, Florida. He was rated by Rivals.com as a four-star recruit and was ranked as the fourth best defensive end in his class. Bosa committed to play college football at Ohio State University in April 2012. As a true freshman in 2013, Bosa started 10 of 14 games, recording 44 tackles and 7.5 sacks. He was named a freshman All-American by the Sporting News and College Football News. In 2014, Bosa was named a Unanimous First Team All-American, the 27th Buckeye in 84 years to do so. He finished his sophomore year with 13.5 sacks on 55 tackles. On July 30, 2015, it was announced that Bosa would be suspended from the first game of the 2015 season with three other Ohio State football players for undisclosed reasons. During his junior year, Bosa finished with 5 sacks and an interception on 47 tackles. On December 31, 2015, he announced his intentions to enter the 2016 NFL Draft. During the 2016 Fiesta Bowl against Notre Dame on January 1, 2016, Bosa was ejected in the first quarter for a targeting penalty when he made a hit on quarterback DeShone Kizer. Ohio State won the Bowl game 44–28. After his junior season he entered the 2016 NFL Draft. Bosa was a highly decorated Buckeye receiving National and Conference honors beginning his Freshman year. In 2013, Bosa was named a First Team Freshman All-American  as well as selected to the Freshman All-Big Ten First Team. In 2014, his Sophomore year, he was named Big Ten Defensive Player of the Year, Big Ten Lineman of the Year, First Team All-American and All-Big Ten, as well as a Lombardi Award Finalist. He repeated most of the honors his Junior year, falling short of claiming the Nagurski-Woodson Defensive Player of the Year for the second time. In early March 2016 Bosa was predicted to be a top 10 pick in the 2016 NFL draft. 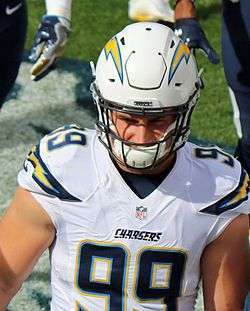 On April 28, 2016, Bosa was drafted 3rd overall by the San Diego Chargers. He was the first of 5 Ohio State players to be drafted in the first round of the 2016 NFL Draft, followed by Ezekiel Elliott, Eli Apple, Taylor Decker, and Darron Lee. Shortly after being drafted, the Chargers announced that he would be playing defensive end in their 3-4 defensive scheme. When he remained the last unsigned draft pick of his class due to contractual disputes with the team, Bosa's mother stated "I wish we pulled an Eli Manning on draft day", referring to the 2004 NFL Draft in which Manning, a highly-touted prospect who was projected to get selected first overall by the Chargers, refused to play for San Diego and forced a draft-day trade to the New York Giants. On August 24, 2016, the Chargers issued a press release stating that they had offered Bosa an initial signing bonus payment that was larger than any rookie has received in the last two NFL drafts, which was more money in 2016 than any rookie in his draft class except Philadelphia Eagles quarterback Carson Wentz. On August 29, 2016, Bosa signed a four-year contract with the team, ending the dispute. He missed the first four weeks of the season due to a hamstring injury. On October 9, Bosa made his regular season debut against the Oakland Raiders. Although he only played 27 snaps he finished the game with 2 sacks, a hit, and 4 hurries. The following game against the Denver Broncos, he had one quarterback hit, 5 hurries, and a stop while also drawing double teams throughout the game. He was named Defensive Rookie of the Month for October. Bosa's father, John Bosa, played in the National Football League from 1987 to 1989. His brother Nick Bosa currently plays defensive end for Ohio State University and also wears 97. Bosa's great-grandfather was Chicago mob boss Tony Accardo. ↑ "Ohio State commit and ESPN 150 defensive tackle Joey Bosa accepts Under Armour All-America Game jersey". ESPN.com. ↑ "Joey Bosa commits to Ohio State". MaxPreps.com. ↑ "'He's going to be a marked guy': What's next for Ohio State's Joey Bosa after a freshman All-American season". cleveland.com. ↑ "Ohio State Buckeyes Official Athletic Site – Football". ↑ "OhioStateBuckeyes.com :: The Ohio State University Official Athletic Site The Ohio State University Official Athletic Site :: Football". ↑ Ward, Austin (January 1, 2016). "Joey Bosa, ejected for targeting, confirms he will enter NFL draft". ESPN.com. Retrieved January 1, 2016. ↑ "Joey Bosa of Ohio State Buckeyes, the projected No. 1 prospect, to enter NFL draft". ESPN.com. ↑ "College Football's 2013 Postseason All-Freshman Team". AthlonSports.com. ↑ "Christian Hackenberg, Joey Bosa headlines All-Big Ten freshman team - Big Ten Blog- ESPN". ESPN.com. ↑ Jeremiah, Daniel (Mar 1, 2016). "Mock draft 3.0: Browns strike for Wentz". NFL.com. Retrieved Mar 11, 2016. ↑ Brooks, Bucky (Mar 2, 2016). "Mock draft 3.0: 49ers reel in Jack". NFL.com. Retrieved Mar 11, 2016. ↑ Davis, Charles (Mar 3, 2016). "Mock draft 2.0: Titans boost defense at No. 1". NFL.com. Retrieved Mar 11, 2016. ↑ "NFL Events: Combine Player Profiles – Joey Bosa". National Football League. ↑ "2016 NFL Draft Profile: Joey Bosa". NFL.com. Retrieved 2016-04-02. ↑ Orr, Connor (August 8, 2016). "Joey Bosa's mom: 'I wish we pulled an Eli Manning'". WEb. Retrieved August 10, 2016. ↑ Patra, Kevin. "Chargers issue statement on Joey Bosa negotiations". NFL.com. Retrieved 25 August 2016. ↑ "Joey Bosa Signs Four-Year Contract with the Chargers". Chargers.com. Retrieved 29 August 2016. ↑ Landis, Bill (October 7, 2016). "Joey Bosa expected to make NFL debut this week with San Diego Chargers". cleveland.com. Retrieved November 6, 2016. ↑ Dieter Kurtenbach. "Joey Boss was worth the wait". Retrieved October 14, 2016. ↑ "Dad tells Ohio State star Joey Bosa to stop doing back flips". NFL.com. ↑ "Ohio State looking to work family ties for Class of 2016 star DE Nick Bosa: Buckeyes recruiting". cleveland.com. ↑ "Nick Bosa, St. Thomas Aquinas, Strong-Side Defensive End". 247Sports.